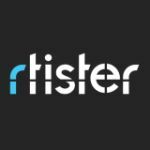 Rtister is the social shopping destination to discover exciting contemporary fashion designers from around the world. The shopping destination for the world's most exciting luxury and contemporary fashion designers. Details: Free WorldWide Delivery. Ends 06/30/2013.